In his magnificent Encyclical, “On the Unity of the Church,” Satis Cognitum, Pope Leo XIII reiterated the Church’s long held doctrine concerning the divine constitution of the Holy Catholic Church. Of particular interest given current events is the Holy Father’s treatment of the unique role of the Roman Pontiff, and the nature of the relationship between the Vicar of Christ and the bishops. This power, however, is dependent upon the bishops’ communion with Peter’s Successor. Now, I do realize that this is rather basic stuff; Catholicism 101, if you will, but I offer it in order to provide a better understanding of the Second Vatican Council’s forked-tongue treatment of the episcopate as proposed in the document, Lumen Gentium. I refer to the conciliar text as such for the simple reason that the Council Fathers, as they so often do, speak out of both sides of their mouth on the matter. At the same time, however, they are clearly at pains to make it appear as though the bishops are not so much subject to the pope who is their master in authority (the traditional teaching), but rather that they somehow rule the Church together with the Roman Pontiff. The Council goes on to likewise speak in Lumen Gentium of the bishops as ruling with the pope some half-a-dozen more times! Is this but a subtle deviation from the truth? Certainly, that is the Devil’s way, but make no mistake about it – it’s a deviation just the same. If you have any doubt, simply ask yourself, is together with the same thing as subject to? One, the text would have more accurately and precisely reflected the true doctrine of the Church concerning papal primacy, and secondly, it would have met with the disapproval of the Council’s modernist bishops and their periti (theological experts). One such peritus was Fr. Josef Ratzinger; present at the Council to assist the progressive Cardinal Frings of Cologne. Really? According to whom did this “need” exist? Benedict doesn’t say, but notice how he, in typical modernist fashion, couches the idea of “giving greater weight” to the office of bishop as a matter of “amplifying” papal primacy. Who is he kidding? It was the exact opposite! Truth be told, Josef Ratzinger has ever been a man of the Council. 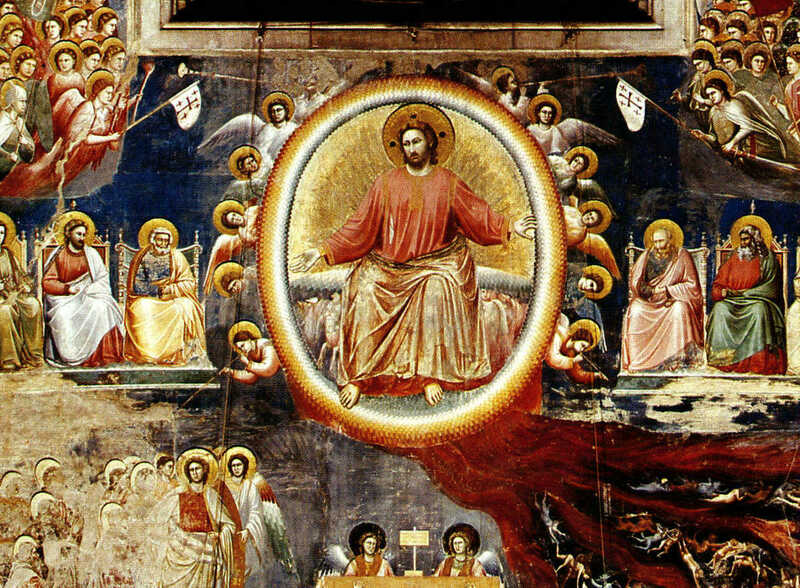 In spite of the “traditional” label that is so often attached to his name, ascending to the Throne of St. Peter did nothing to change his decidedly conciliar orientation. This includes, of course, the specious proposition put forth repeatedly in Lumen Gentium; namely, that the Roman Pontiff in some way governs the house of the living God together with the bishops. Indeed, he even described it as necessary. None of this is exactly news, so why do I do bring it up now? 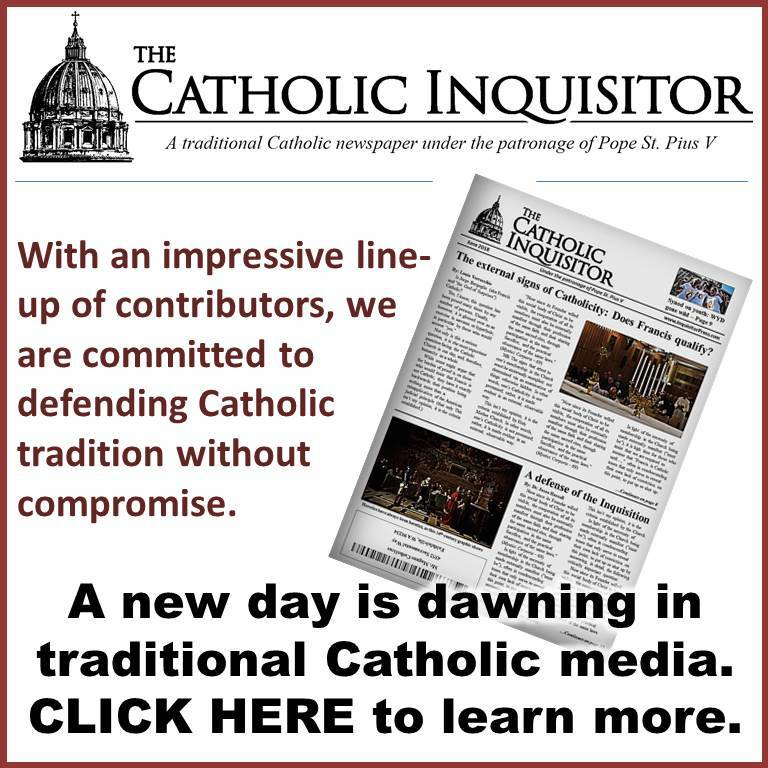 I would submit to you that the Council’s fallacious treatment of the Church’s constitution; specifically as it concerns the bishops’ relationship to the Roman Pontiff, is the fertile ground whereupon the diabolical notion of a Petrine ministry endowed with a “collegial and synodal dimension” (see Archbishop Gänswein’s recent speech) initially took root and eventually blossomed in Benedict’s mind. To precisely what theological point of view does the archbishop refer? It certainly was not the one expressed so very clearly by Pope Leo XIII in Satis Cognitum, but rather the one so carefully crafted by the progressives at the Second Vatican Council in Lumen Gentium. You see, convinced as he was that the conciliar proposition somehow “amplified” the traditional doctrine on papal primacy, Benedict had no difficulty imagining that a “quasi-shared” Petrine ministry would do the same. Where the Council “amplified” the papacy; Benedict simply “expanded” it. 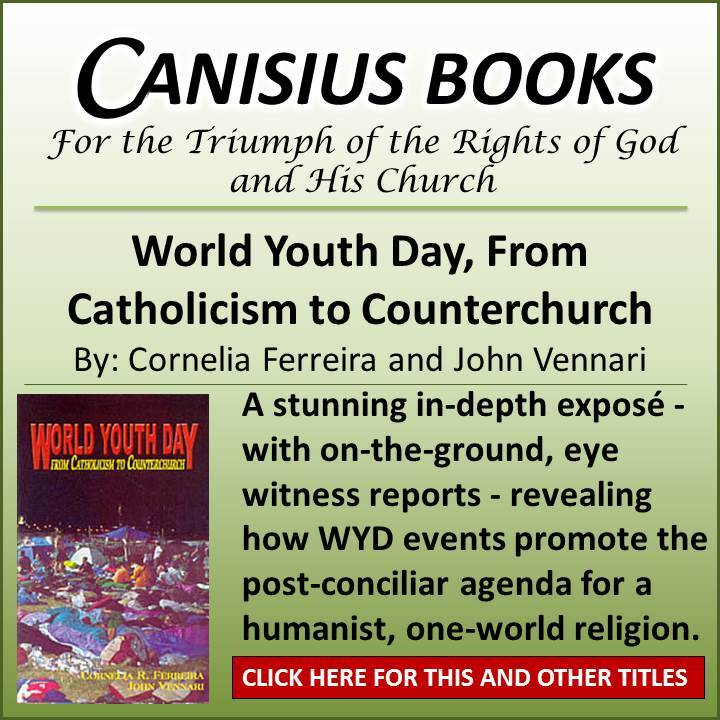 Mere men amplifying, expanding, and enriching the divine constitution of the Church as established by Christ – it’s all in a conciliar day’s work. Don’t count on it, sir. Excellent article. You can take Benedict out of the Council (as the neo-cons do), but you can’t take the Council of Benedict. Those who endorsed him as “the Pope of Christian Unity” and “the friend of Tradition” now need to eat their words big time. What next, a triumvirate of Benedict, Bergoglio and whichever brain-dead pseudo-conservative they can convince to join them? If it weren’t so tragic, it’d make a fine farce. Lord have mercy. I’m just waiting for that Ever So Holy Pope which Our Dear Lady promised will guide The Church. This will also finally be when The Pope will consecrate Russia to to Our Lady’s Immaculate Heart. Until then, we remain in whatever mess is thrown our way. THEN and only then will order be restored and our hearts be at rest. Pray the Rosary specifically for the conversion of sinners and for The Pope to consecrate Russia to Our Lady’s Immaculate Heart! This was her request. She was talking about us. Nothing for us to figure out here. It’s now or never. After her request is granted by the Pope, She promised a time of great peace and restoration of the Church Church. I do believe it will be obvious to all who That Pope is when it’s happening. It ain’t happening now with any of our 2 popes. At that time, I doubt those living will be wondering which Pope is the traditionalest. What a Heaven, sent man that will be! What a romantically, Glorious time for Our Church! We have been waiting our lifetime for that. Right? I hope we can all be there. My eyes have not seen, nor have my ears heard. Imagine, we may have been born, believe it or not, at an exceptionally, remarkable time. This counciliar effect has flowed down to the parish levels, where the pastor has very little authority, and what ever is left has been so diluted as to make him become ineffective. Every decision, no mater how mundane, now has to be submitted to a democratic vote. I was a Knight of Columbus member once, and I remember the foolishness of submitting a dinner menu to a vote! (string beans won out over carrots in a very tight race). The number of “ministries” grows every year like a cancer, undermining the pastors authority by giving a platform to dissenters and other assorted control freaks. Particularly this is noticeable in liturgy, music, education, and finance matters. The typical parish priest has been castrated and hobbled by an army of (mostly) female ministry “leaders” who want to stake out a piece of authority and power for themselves. November 1984, Cardinal Ratzinger revealed that he had read the Third Secret and that the Secret refers to “dangers threatening the faith and the life of the Christian and therefore (the life) of the world.” The Cardinal further revealed that “the things contained in this Third Secret correspond to what has been announced in Scripture and has been said again and again in many other Marian apparitions, first of all that of Fatima …” The Cardinal also equated Fatima with the warnings of Akita, saying that they were essentially the same message. The Third Secret of Fatima is composed of twenty to twenty five hand written lines of text on a single sheet of note paper. The Secret was dictated by Our Lady of the Rosary in a supreme effort to save the Church. The words of Our Lady have to be incredibly powerful and insightful. The burden of its weight increases for Benedict as the critical year 2017 approaches. 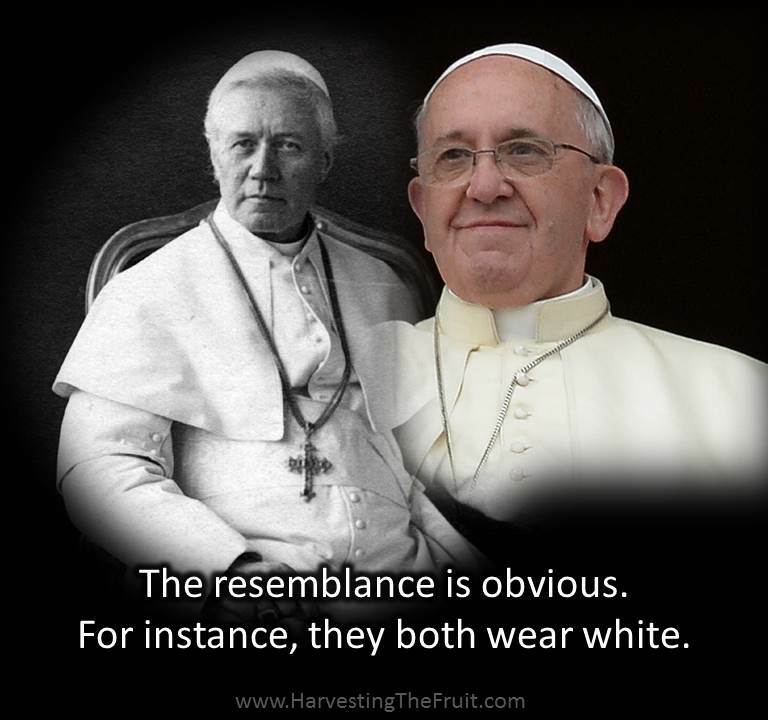 A dual Papacy might be Ratzinger’s desperate attempt, like his predecessor, to find a way around the one thing that stands in the way of a complete Modernist takeover, The Third Secret of Fatima. Yes! You are right, Rushintuit! 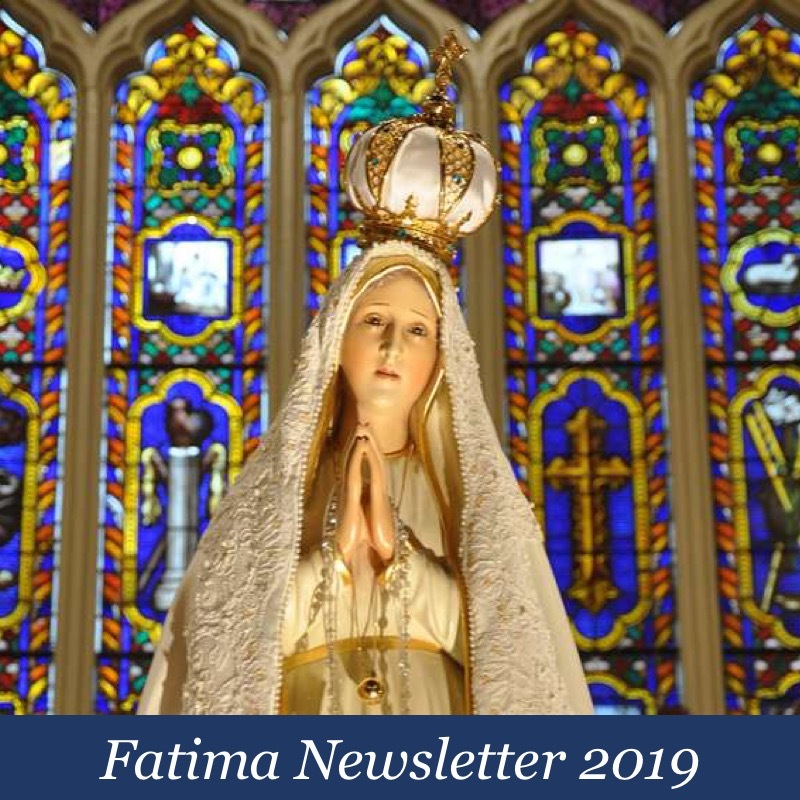 The Third Secret of Fatima is so – so – so – so – important! They absolutely HATE it. They want it to go away. Sister Lucia is gone (even the fake one). Fr. Gruner is gone. And they tried to make the 3rd secret go away. Our Lady did not make the sun spin before the eyes of 70,000 + people for no reason at all. It was for US — in our time. We had better pay attention. Our Mother was trying to get our attention. For as much as they have done to try to quiet Her, it is amazing that we know as much as we know. Eternal rest grant unto him o Lord….. I don’t think the devious modernists who composed the documents of the Second Vatican Council counted on an intelligent analytical mind like Louie to expose their scheming minds and diabolical agenda. Ratzinger was “one of the boys”, for sure. I hope he lives long enough to truly regret his involvement and be an instrument to bury Vat 2 and save his own soul. Thank you, Louie, for shedding light during these dark days. 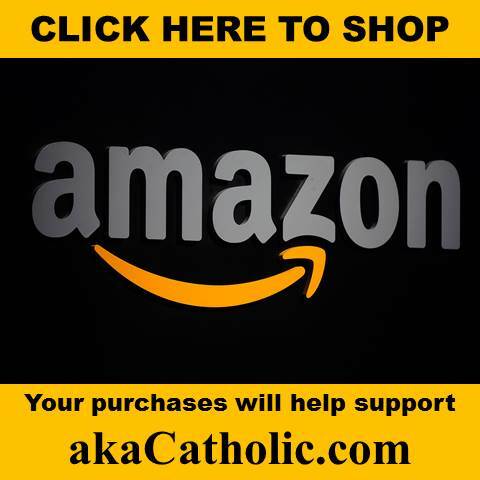 SSPX priest Fr. Pierre Roy explains to laity in canada why he is leaving. Wow. This is crazy, Louie! I do not know how you are able to decipher this modernist jargon. It takes great patience, I’m sure. Wow. They have taken EVERYTHING apart. What a masterful plan of satan’s —- that God has allowed. I’m with you, Cortez, waiting for that holy prelate who will consecrate Russia and put back all that is sacred and holy and Catholic. Of course, I DO realize that the “restoration plan” of God’s is not what I am expecting. God’s plan will be very different than I envision, I’m sure. So, I know that what I think will happen with the Holy Prelate, the consecration of Russia, the restoration of the Catholic Church, etc., will not happen they way I imagine. But I am confident and hopeful in Our Lady’s multiple promises that restoration will occur. Of that I am certain. May we all persevere through this passion of Our Holy Mother Church. May God and Our Lady reward you, Mr. Verrecchio. 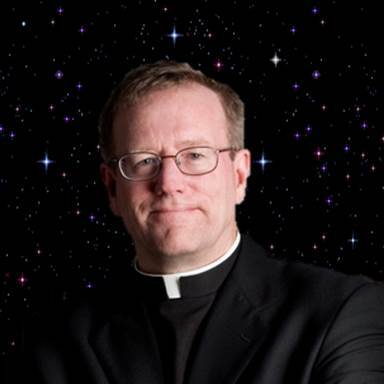 I couldn’t agree with you more dear Servant of Our Lady, Fr Gruner was my parish priest in my mind and heart because here in Boston most of our parishes and parochial schools were decimated and infiltrated by modernists.Father Gruners Fatima Crusader truly restored me to all things Catholic in the purest sense of the word….fortunately my first eight years of catholic school were pre VII and Fr confirmed what I had received from the good sisters at the time. I was able to apply true catholic teaching in the raising of my two daughters from the guiding hand of that saintly priest , both girls are in their thirties, married and devout to the Rosary , and have a clear understanding of the times in which they are living as well as the state the church is in. Hopefully Archbishop Gainswain will soon come to realize that the period of history the Church is in has everything to do with Our Lady of Fatima’s dire warnings and that sadly his Pope Benedict XVI is adding to its dire state of confusion. Yes, Theresa. May Fr. Gruner rest in peace. You are a TRUE miracle of Our Lady’s if you have preserved the True Faith for your family while living in Boston! God bless you and your family, Theresa. My2cents and servant of Our Lady, just hours before I read this article, I was thinking something similar to what you were saying about not counting on anyone to figure out their well plotted, grand scheme. What they didn’t count on is TRUTH or God’s undefeatable Church. It’s wondrous how God’s Almighty Power allows little nothings like me and others to see through their “grand plans”. (Of course with a little help from Louie and other Truth tellers in our lives, He allows our ears to hear) That must really bother them though. Our Lord will always be victorious! I wonder, why does anyone try to defeat God. Why does anyone think that they could get one past Him? Then again, I guess it’s all about deceiving souls and the devil gaining souls in hell. 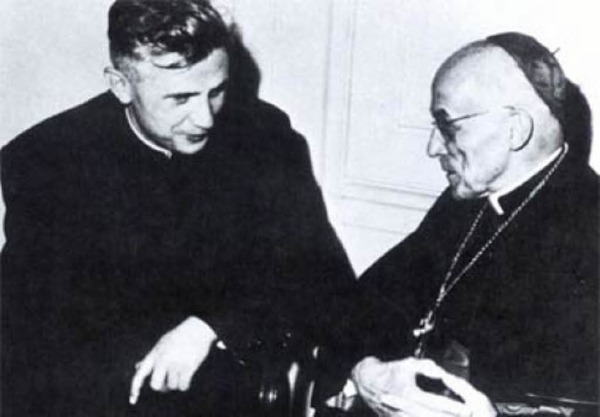 And how as Archbishop Lefebvre is communion with his fellow bishops? It seems to me that there is a certain degree of trying to have ones cake while eating it. Archbishop Lefebvre, rightly or wrongly, fails to pass the test of communion.